Canyon Creek Riding Stable is located in the beautiful Wisconsin Dells. Our facility is family oriented and has something for everyone. From the petting zoo to the miles of horseback riding trails, you can spend hours getting to know the furry four-legged friends both in the barns and out in the wild. For individuals interested in riding the trails, the horses know the lay of the land as well as your guide. 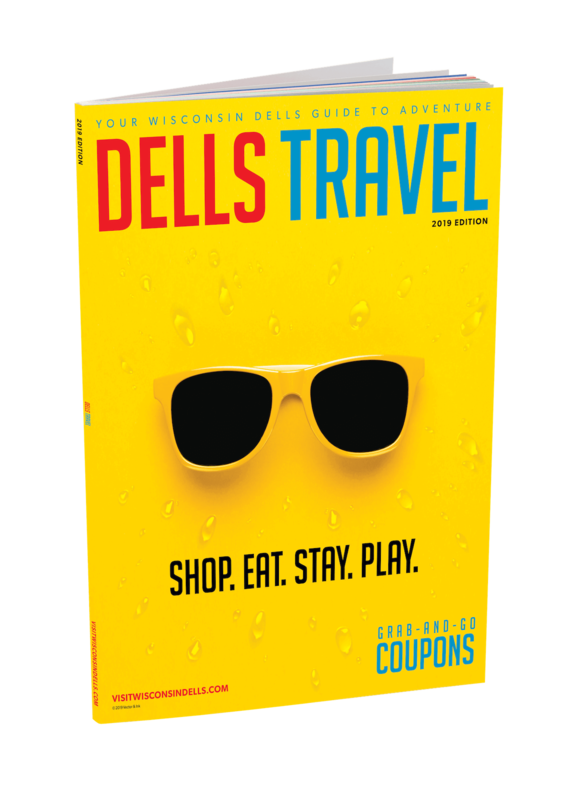 They will be your transportation for hours of fun as you discover the Wild West as seen in Wisconsin Dells. Introduce yourself to western characters ranging from cattle rustlers to lawmen. Talk to the locals and have a cold beverage at the local saloon. 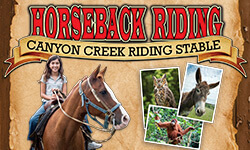 Canyon Creek Riding Stable is affordable fun that is safe and entertaining for all ages. No matter what your pleasure, you'll find it here. We offer interactive and educational entertainment. Allow yourself to observe nature from horseback and feel like you're part of it. Watch the animals as they go about their lives in the wild then, when the ride is over, walk through our shops and visit the Wild West town and petting zoo. Drift back in time and take a break from the hustle and bustle of every day obligations. Relax and enjoy the feel of days gone by as you sit and enjoy a meal or walk through quiet western streets. There is fun to be had with family and friends at Canyon Creek Riding Stables. The trail was beautiful.. The horses look like they are very well taken care of and so friendly. I think it was the best way to start my six year old daughter horse back riding ( Who has never been on a horse before Canyon Creek Riding Stables in Wisconsin Dells) and she just fell in love with it. She started crying when the ride ended. I was able to cheer her up at their petting zoo which was Free. The animals just greeted us as we walked in. I couldn’t thank them enough for such a great time and fun.. I highly suggest this riding stables in the Dells. We have been on several trail rides: Oklahoma, Colorado, Illinois, and several in Wisconsin. I liked the price for the amount of time we rode. Can’t beat that. Plus, the view was amazing. It had rained off and on a LOT, so the trail (and horses) was very muddy. I had already warned the children (12 & 14) that the ghost town was going to be just fronts. I did expect to see some people walking around like the brochure…was empty. Lots of movement sensitive talking animated animals…wasn’t necessary. Spoiled it for me. When we got there, we paid at the window, and we were sent across the street with our tickets. Gave the tickets to the man at the gate, and we were sent up the stairs to wait for our horses. Told the man at the gate that my son wasn’t an experienced rider, but my daughter and I were. We were matched up with good horses and immediately put in line with a group walking out. Didn’t receive any instructions. Finally, the guide turned around on her horse and introduced herself and gave some instructions. Too many in party ahead of us to hear her. Lots of inexperienced young riders in party. Didn’t see it, but my son told me…One girl was holding reins to hard in tunnel and the horse fell with her on it. Not sure if guide knew what was going on. My horse kept trying to bite at my right foot like he had an itch or the equipment was bugging him. Told the guide when we returned, not sure if she took care of him or checked him out. Felt like once my money was taken, I was slapped on a horse and then slam, bam, thank you mam. The center should take more interest in their customers. Other than that, it is a good ride. My son isn’t too interested in riding at all and would have preferred to sit it out. Not his thing, but he went with us anyway. My daughter and I would take this trail ride again. However, we would request a smaller party or private ride. The thought my husband got on a horse still amuses me. He ENJOYED the personalities of the horses and the level of comfort the tour guides had…. I was surprised by family and friends last week when they took me to your riding stable. I love horseback riding and had not been in some time. We were visiting Wisconsin from Las Vegas. What a great time we had. The trail was beautiful. We saw so many deer and especially loved the little fawn we saw. We saw a woodchuck too! Our guide, Brianna ( I hope I am spelling that correctly) was AWESOME. She was very informative and friendly. I felt bad that we had very little cash with us to give her a proper tip. I will send that by mail to her. The Petting Zoo was fun too! Even though we were a group of adults, we really enjoyed it. I recommend this company 100% and cannot wait till I can visit again.